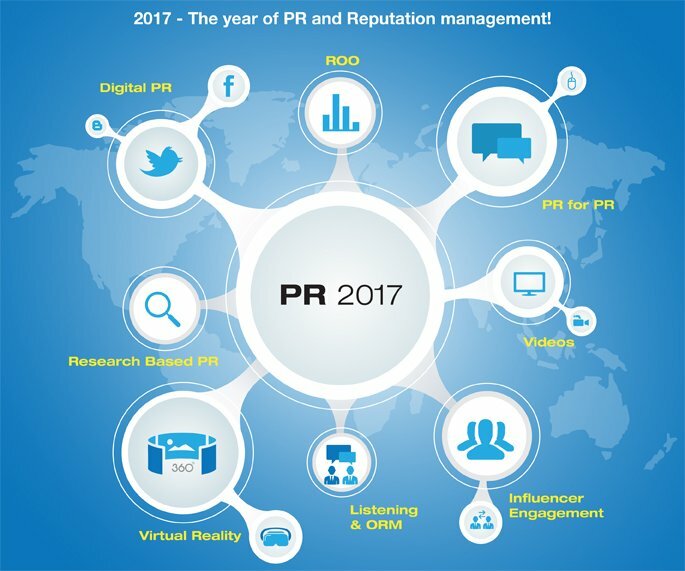 Having defined it as “Earned Social Media”, our experiments with digital PR have yielded significant 2017 – The year of PR and Reputation management! Digital PR will garner more significance – Having defined it as “Earned Social Media”, our experiments with digital PR have yielded significant results. In fact, this has become one of our key tools for launching products and creating a digital safety net for brands and related causes. The ability to reach significant number of social platforms through compelling content (videos, infographics, text, images) has become a reality and will only grow further. Influencers (read bloggers, KOL, etc.) have started to become contributors to your brand narratives. The power of a well-informed influencers/advocates who can connect their followers with your brand is unmatched. In fact, I feel that just the way PR agencies used to maintain databases of journalists, time has come to start maintaining lists of bloggers and influencers, the difference being, the later would be humongous! I see augmented reality and virtual reality as the next big revolution in PR and communications industry. My own experiments with VR to give an immersive experience to the stakeholders makes me absolutely confident that VR is here to stay! With the right technology partners, right equipment and competencies, this will emerge as one of the most powerful tools for experiential communications. My personal experience says that the effectiveness of PR campaigns goes up if there is an experiential and interactive element to it. Content is any which ways considered ‘king’ but if it becomes immersive and audiences can get a touch and feel of it, it can be an emperor!! These are the possibilities with AR and VR. Honest, humanized, immersive content generally gets larger traction and AR/VR enables it. Product launches could become more realistic; audiences can experience products before making a decision and interaction points can increase significantly. Virtual reality can possibly transcend space and time. It can in a near realistic way transport people to destinations or interact with lifestyle brands in a manner that is more inclusive rather than one way. Simulation of crisis during trainings could be done more effectively and the attributes of consumer durables can be explained in a more holistic manner. Come to think of it, it can be a huge enabler for communicators to communicate their brand narratives in a more convincing manner. Research not only adds to the authenticity but also credibility to the claims made by a brand. With the amount of clutter, we see in the media, research based narratives that have a direct bearing on consumers will be essential to get covered. A majority of the Godrej campaigns have been based on research data that validates the claims of our brands. This has ensured a dramatic rise not only in coverage but also right messaging and tonality. If I were a PR consultancy, I would invest in research capabilities going forward! Live or otherwise will be a key driver – As our media consumption patterns change, video is emerging as a key mode to establish narratives. It has been predicted that over 70% of mobile traffic will be video by 2020. Live video has exploded in 2016 with Facebook live, periscope and many other social platforms opening live streaming. Brands that have made compelling videos around their purpose and USP’s have immensely benefited with a never before reach and downloads. I feel, this will only grow and become a major part of the integrated communication strategies. Going forward, it is more and more evident that Public relations work will transform more into earned, owned and paid media generation. PR professionals will find themselves increasingly doing work that transcends the traditionally rigid boundaries of earned, owned, or paid media. Trying to pin point the contribution of one particular genre is not only difficult, it is preposterous. PR industry hence, finds itself fumbling when it comes to establishing uniform, universally accepted measures which translates in to the larger question of how do we demonstrate value add towards the organizations growth. Hence, it is just a pity that most of the times ROI of millions of dollars spent on advertising are never questioned the way ROI on a fraction of that amount spent on PR is. I personally feel that since the communications environment is becoming integrated, it is more important to make the measurement integrated across tactics and channels. The Barcelona principles that have been recently updated have also made certain changes. While I fully agree with the seventh principle viz. “measurement and Evaluation should be Transparent, Consistent and Valid”, my favorite is the principle number one. It states that “Goal setting and measurement are fundamental to communication and public relations”. I cannot agree more. With multiple stakeholders across multiple businesses and geographies; within and outside the organization enabled by a global information landscape, the PR measurement conundrum can be complicated. Trying to quantify could be even more. Can one quantify the cost of reputation saved due to effective PR? Can we assign a monetary value to it or the frequent crises a PR team mitigates silently and claim it as the ROI? I feel, the best way for a PR function to create and showcase value is to align its strategy to the top organizational goals, articulate business/brand related PR objectives in line with this strategy, set the expectations right with the C-suite by jointly agreeing on the objectives and measures of success and then go all out to ensure that the objectives are met hence demonstrating maximum return on objectives (ROO). The pace of change in the past decade has been significant. In a fast evolving business environment with multiple external stimuli impacting business performance, and with multiple disruptive modes of communications and platforms for data consumption by the stakeholders, the operative scope of a PR professional has favorably amplified. Today, we significantly impact multiple levers – corporate reputation, employee retention, crisis mitigation, sales, product brands, stock price, stakeholder engagement and many more. We as a PR community (and even Marketing, Finance, Strategy, Sales, HR and other functions) know it with conviction that PR works. Then, why do we seem so apologetic? It cannot be just the fact that we have not done enough PR for PR, the way we have done PR for other functions. I hope PR does significant PR for itself in 2017! 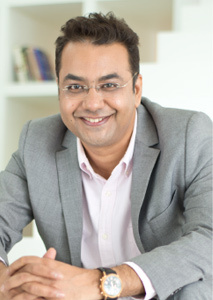 Sujit leads a diversified communications team and drives corporate and brand Sujit leads a diversified communications team and drives corporate and brand PR at Godrej. Prior to joining Godrej, Sujit led a global Corporate Communications function at Tata Chemicals Limited. Sujit has extensive experience in working across the communication spectrum including in global branding, crisis communications, digital PR, sustainability and M&A. A winner of over 150 national and international awards for internal and external communications, he is a regular speaker at key industry conferences including the World Communication Forum, Davos. He is among the three globally accredited business communicators in India, certified by the International Association of Business Communicators (IABC). He is also the winner of the IABC International Gold Quill award, the only Indian communications professional to win this global accolade thrice. This year Sujit was recognized as the “Outstanding Godrej Ambassador” at the Godrej global awards. He was also listed as India’s top ten men in corporate communications by Reputation Today and featured on the PRWeek Global Power Book 2016, the definitive guide to our industry’s most influential operators around the world. Sujit was recently appointed as the Chairman of the Mumbai chapter of Young Indians (Yi), the youth wing of CII.